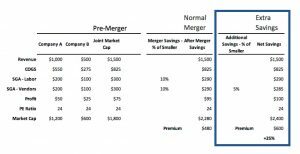 Mergers are rationalized by the expectation of post-merger synergies, a major one being cost reduction. However, cost savings opportunities that are routinely exploited by procurement are rarely a focal point for “clean teams” in pre-merger scenarios, or by the merged organization in the key 100 days of post-merger integration (PMI). Cost synergy is the savings in operating costs expected after the merger of two companies. Acquirers build these expected synergies into their bid price. Historically, buyers have been willing to factor between one-half and one-third of expected synergies into their pricing models. 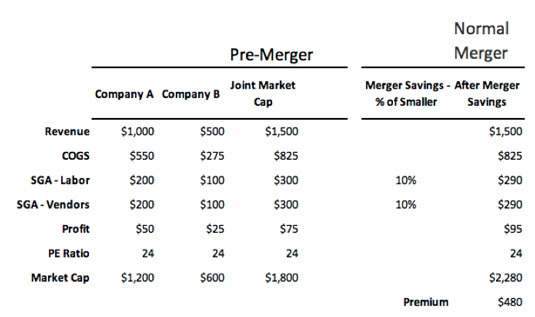 In fact, the majority of mergers rarely deliver all of the expected cost savings. In contrast, procurement can play a crucial role in planning for and delivering cost savings typically overlooked during the pre-merger analysis. Indirect costs don’t get the attention that strategic costs do. But indirect costs are sizeable, the savings opportunity is significant and they are part of every merger. And, addressing indirect costs early in the process is not disruptive to other merger activities. As a rule of thumb, for every dollar spent on SG&A (indirect) labor, a dollar is spent with SG&A vendors on “stuff.” What is the impact of indirect cost savings on the merger premium? Consider a merger between Company A and Company B. The savings plan assumes a 10% savings in SG&A, split between labor and vendor costs. 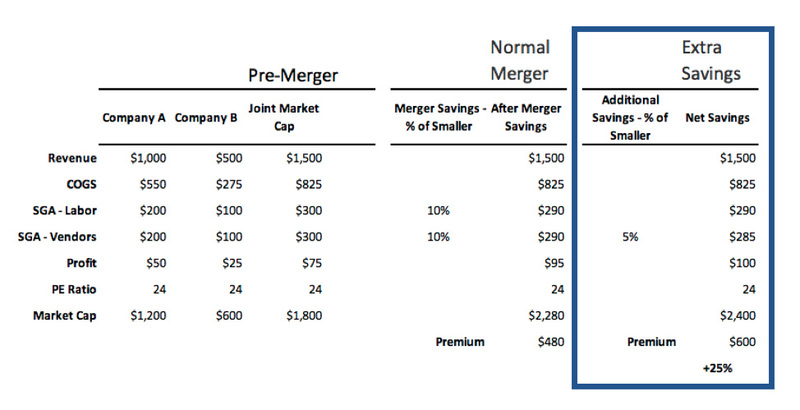 These savings fall directly to the bottom line, producing a merger premium of $480. For modeling purposes, suppose this extra reduction is 5%. This is likely to be an easily achievable number in most mergers, and in many cases an underachieving number. These savings also drop to the bottom line, increasing the merger premium by 25%. The work on indirect cost savings should begin as early as possible. A “clean team” can be used to handle sensitive information before the deal has been finalized. In order to estimate realistic cost synergies, the team needs a strong understanding of cost structures and cost drivers. This requires the construction of spend cubes for both companies in order to create a cross-organizational understanding of combined spending. The process cannot take a long time; it must be quick to be effective at the pace of a merger. The idea is to (1) build spend cubes for both companies, then (2) link them on vendor and commodity dimensions to explore commonalities. Because speed and efficiency are paramount for the first step, unwieldy first-generation spend analysis systems with offline mapping tools (or data warehouses and spreadsheets with no mapping tools at all) are not helpful. To work at the speed of a merger team, you need modern, agile spend analysis tools that can map both companies’ spend online, quickly and with high visibility. For the second step, dataset linkage on common dimensions requires technology available in only a handful of tools. Massive Excel sheets with pivot tables and VLOOKUPs are not a practical alternative. Armed with a combined spend cube, a pre-merger analyst can easily estimate the benefits of consolidated buying power, as well as the likely savings from vendor consolidation. For example, IT projects that may not continue post-merger can be identified and added to the savings column. If there are no contracts with vendors from either company, savings of 14% or more can be anticipated. If a contract exists in Company A, but not in B, there are savings literally on the table, since A can convert to buying on B’s contract. On the negative side, the existence of long-term contracts may delay action, so potential cost savings impacted by them can’t be included in savings estimates. When factored into premium calculations, the impact from a disciplined procurement approach can generate significant economics in a merger. After the tight time frames and pressures of the merger integration pass and things return to business as usual, the combined spend cube can be used to extract additional value. For example, with the rigor of a disciplined spend analysis process and purpose-built tools, significant value can be found in contract compliance, demand management and commodity/product standardization. Very interesting! Post M&A synergies are becoming a use case for our sourcing pipeline management solution (Per Angusta). Once armed with spend data and contracts information it becomes easy to build the action plan (including savings targets), follow up on the execution, and give visibility on the progress. A side effect is that having the visibility on the pipeline removes the black box, “cut costs at all costs” effect and makes the process a bit more human.